Eighth graders at Paynesville Area Middle School passed the Basic Skills Test, given each February, at their highest rate in the seven-year history of the tests. Eighty-six percent of the 107 eighth grade students who took the Basic Skills Test passed the reading portion of the test, and 84 percent passed the math, according to the Department of Children, Families, and Learning, which released the test results last week. The percentage of eighth grade students in Paynesville who passed increased for the third consecutive year. This year's passing rates of 86 and 84 percent were highs for the school. They also surpassed the state averages again. The test results show that "we're very aware what the competencies are," said middle school principal Deb Gillman, who also serves as the district's curriculum coordinator. "We are making sure that our students have a good foundation." The Basic Skills Tests are part of the state requirements for education, along with the controversial Profile of Learning, or high standards. The Basic Skills Tests aim to check that students have mastered basic concepts. Passing the tests is required for graduation. Students may retake the test in the summer and again in February until they pass. Another handful of PAMS students missed passing by three questions or less. "These are kids who aren't missing major concepts," explained Gillman. "These are the kids who, without any help, will pass this summer." Other students will need to focus on areas of trouble. The math test, in particular, breaks each student's performance into several areas: problem solving, number sense, estimation, measurement, graphing, chance and data, and shape and space. By reviewing areas they scored well and low in, students can focus their studies on improving certain skills. Gillman says this allows for data-driven decisions to be made about the student's learning needs. The reading portion of the test offers less insight into individual performance, breaking the reading questions into only two areas: literal comprehension and inferential comprehension. Over the seven years of testing, Paynesville's reading scores have improved the most dramatically, from 48 percent passing in 1996 to 86 percent this year. Gillman called the improvement in reading scores "phenomenal growth" and said the school had changed its focus in teaching reading significantly in order to improve the school's test scores. "You have to give credit to our teachers," she said. "I'd like to go for 90." A few years ago, Paynesville would have only one perfect score each year, said Gillman, whereas now it will have a handful of perfect scores. The school mailed out test results to parents late last week. In her letter to parents, Gillman, who supports the testing, stressed that the Basic Skills Test asks students to display real-life skills. Who can argue with expecting students to be able to read a newspaper story and understand it, Gillman wondered. 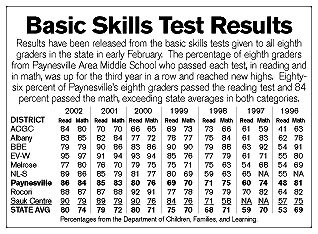 Paynesville does not exempt any students from the Basic Skills Test in eighth grade. According to Gillman, the school wants to get an idea about each student's needs. The requirements for passing can be changed individually for a special needs student. Gillman did warn that Paynesville's scores will not always rise every year, especially in light of some of the budget cuts over the past two winters. No longer offered are a remedial math specialist in the middle school or four weeks of summer school. Next year, the entire middle school concept will be changed with the elimination of the middle school principal position. "There'll be a year when we will go down," Gillman predicted. "But the overall trend is up. That's what you need to continue to do." The Basic Skills Test results are available on the Department of Children, Families, and Learning's website at: www.cflapp.state.mn.us.